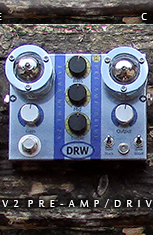 Our mantra: DRW have built our reputation for supplying boutique guitar pedals of the very highest quality at extremely competitive prices. We have achieved this status through rigorous quality control and the use of only the highest quality suppliers. We have pride in what we do and will always cast our eye for detail over every aspect of every product we ship through our door. Quality counts: Rugged aluminium cases, extremely tough decals and aluminium control knobs. Neutriks or Switchcraft jacks - top quality 3 PDT switches coupled with the highest quality internal components and meticulously planned PCB routing. These factors help us to ensure we can stick to our no compromise approach to pedal design. In short - our products are purest analogue. All pedals available now: but due to demands brought about by the recent appearance in Guitarist Magazine's March 2015 issue our limited edition germanium fuzz pedals are starting to shift quite quickly. We do have stocks left at the moment but please order quickly to avoid disappointment. Lead Times: Every process in the manufacture of our touring grade guitar pedals is done by hand. This does mean that at busy times we are compelled to introduce lead times. Lead times allow us to ensure that our customers get their lovely pedals on the day we promised. Any lead times will always be displayed on this website in a prominent position. • Preamps and compressors usually go at the front of the chain. However, envelope filter (auto-wah) pedals, (which need a variable signal to operate properly) must be placed before your compressor. • Next, add your noise-making pedals: overdrive, distortion and fuzz - these will interact and you will need to find the right 'pecking order'- usually this will mean putting the pedal on which you dial in the highest gain setting after the others. If using a huge amount of gain - these pedals may be best right at the end of the chain but try this method first reigning the gain in to reduce noise. • Modulation effects (chorus, reverb, flangers) theoretically belong close to the end of the chain. They operate best with an even signal so must be placed after your compressor. 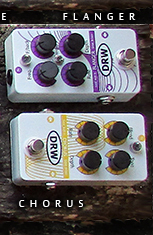 They can also be quite noisy so usually work better placed after pedals like distortion which amplify the signal. • Finally add your EQ and Noise Gate. If you're using a reverb pedal try it before and after your noise gate. • These are only guidlines -it's always good to shuffle the order of pedals in your effects chain and see what sounds best yourself. 1% metal film resistors throughout. Our Aim: is very simple, to supply you with classic vintage based designed products that are fully hand built here in the UK, have a fantastic reputation for their audio capabilities and are of the highest quality in every aspect, to emphasise our commitment to this, all our products are sold with a no quibble, 2 year parts and labour guarantee. (T&C's). Our customer service is very important to us and we believe plays a big part in any company, any questions please do Contact Us and we will reply as soon as possible. Our Experience: we have over 35 years experience in the professional audio industry, having staff that have worked for landmark British companies including Calrec, AMS and Neve all of which you will agree supply quality products and service, we aim to do the same. Our Products: our totally hand built, British made, guitar pedals are of the best quality, we hope you'll agree! We welcome any feedback and suggestions so that we can continually improve to offer you great products that will result in your return business, or recommendations to others, this is very important to us. Our Wish: To create products that inspire. If we can build a pedal that transforms your playing, evolves your style or germinates a new piece of music - job done.